Note: This process describes how to manually create a user account. When LDAP or Active Directory are integrated, user accounts can be created automatically. See LDAP integration. In the Maintenance menu or on the Home page, click Users. A page showing all created user accounts appears. 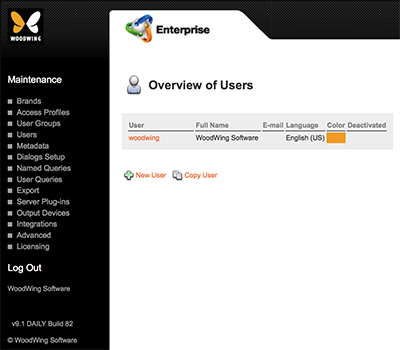 Figure: The Overview of Users page shows all created user accounts. Note: When LDAP is integrated in Enterprise Server, an additional column named 'Assigned to User Groups' is shown. Step 2. Click New User. 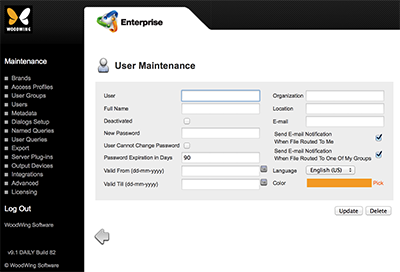 Figure: The User Maintenance page is used for setting up the user account. User. Short user name, normally used for logging in. Full Name. Full name of the user. User names may be up to 63 characters long (including special characters). To overrule the user name used in e-mail notifications, configure a custom user name. Deactivated. Option to deactivate a user without removing the user from the system. This is very useful for temporary employees that are expected to return. See Deactivating user accounts versus removing user accounts. New Password. User's password (mandatory). User Cannot Change Password. Determines whether the user can change his/her password by using the client application interface. Organization. Name of the organization that the user is working for. Used for reference only. Location. Location of the organization that the user is working for. Used for reference only. E-mail. E-mail address of the user, used for e-mail notifications. Note: You can overrule this e-mail address by configuring a custom address. Send E-mail Notification When File Routed To Me. Determines whether the user should receive e-mail notifications when a file is routed to the user. Send E-mail Notification When File Routed To One Of My Groups. Determines whether the user should receive e-mail notifications when a file is routed to a group that the user is a member of. Language. Language the user prefers to use in the interface. For more information, see Languages. Color. Color to distinguish the user from other users. Mainly used as the color for tracking changes and creating Sticky Notes in InDesign, InCopy, and Content Station. To change the default color, click the Pick button and select a color from the palette. The user is added to the system. Before the account can be used, it needs to be added to a user group. See Adding a user account to a user group. When you need to create a new user account with settings that are identical to an already existing account you can create a copy of that account to use as a starting point. The settings that are copied include certain fields as well as all user groups that the account belongs to. User Cannot Change Password Determines whether the user can change his/her password by using the client application interface. Organization Name of the organization that the user is working for. Used for reference only. Location Location of the organization that the user is working for. Used for reference only. Send E-mail Notification When File Routed To Me Determines whether the user should receive e-mail notifications when a file is routed to the user. Send E-mail Notification When File Routed To One Of My Groups Determines whether the user should receive e-mail notifications when a file is routed to a group that the user is a member of. Language Language the user prefers to use in the interface. For more information, see Languages. Color Color to distinguish the user from other users. Mainly used as the color for tracking changes and creating Sticky Notes in InDesign, InCopy, and Content Station. To change the default color, click the Pick button and select a color from the palette. Step 2. Click Copy User at the bottom of the page. The Copy User page appears. Step 3. From the Source User list, choose the user from which the settings need to be copied. Step 4. Fill out the remaining fields on the page. Step 5. Click Copy User. Step 3. In the User Groups section, click Delete for the user group from which the user needs to be removed. The user is removed from the group and the list is updated to reflect this change. Step 3. In the Users section, click Delete for the user that needs to be removed from the group. Note: The following actions will completely remove a user account from the system. An alternative method of denying a user access from the system is to deactivate the account. See Deactivating user accounts versus removing user accounts. The user is removed from the system and the Overview of Users page appears again.